I find the role of Microwave ovens in our lives to be a curious one. There’s a certain ambivalence towards this ubiquitous tool. A few people outright hate them, but they are in nearly every kitchen, and people tend to use them in very habitual and very limited ways. It’s as though everybody bought deluxe cable packages yet only ever watches two or three channels. Microwaves excel at reheating most types of leftovers. Microwave popcorn is so popular that it’s become a source of workplace conflict. Lots of people find the microwave more efficient than the kettle for heating water for tea. Softening butter or chocolate is simpler in the Nuker than in a Bain Marie. But actually cooking in a microwave? Most people put away the novelty microwave cookbook in 1985 and haven’t looked back. Let me change gears here for a bit and give you some microwave history and science. Like so many inventions, the microwave oven was a by-product of other technology. A man named Percy Spencer was testing some new radar technology in the mid-40’s when he noticed that the chocolate bar in his pocket had melted. Curious, he placed some popcorn kernels (what else?) next to the vacuum tube he was working with and sure enough, they popped. The fact that it is non-ionizing radiation is significant, because many of the anti-microwave arguments are based simply on the idea that radiation = bad. I’m not going to get into the science of radiation, but I will just say that other examples of non-ionizing radiation include radio waves, sound waves, visible light, and infrared (which of course includes the infrared lamps used to keep food warm). What all this means in terms of application is that microwaves penetrate farther and faster into food than the heat energy from conventional cooking methods. The “cooking from the inside out” claim isn’t in fact accurate, and especially thick foods can still be raw in the middle after microwaves have sufficiently cooked the outside. Where microwave ovens fail is in browning applications that require the food to be in direct contact with a hot surface. Accessories such as the foil-lined trays found in some frozen microwave-ready foods try to combat this weakness. At any rate, microwave ovens began sweeping the consumer market in the early 70’s. Some of the early models leaked, which gave the technology a bad reputation. Tests indicated that the injury from exposure would be limited to mild heat burns or short-term sterility (the waves could kill sperm but not interfere with production of new healthy ones). Despite FDA assurances, people associated the leaks with scary radioactivity and developed rituals such as standing well away from the oven and waiting for several seconds after the oven turned off before opening the door to be extra sure that the waves had dissipated. Still, the convenience outweighed the fear, and the home microwave oven persisted. The 80’s saw a rush of microwave recipes and consumer goods such as microwave cupcake kits. Most of them sucked, and the failings of these recipes and goods was only exaggerated as microwave wattages increased and attempts to compensate for this led to inedible failures. The finicky nature of microwave cuisine remains one of the biggest challenges for those who want to more fully utilize the appliance. More on that later. In case you can’t tell, I went into my research ready to dismiss out of hand the anti-microwave arguments that are still floating about. Email forwards like the “Microwaved Water Kills Plants” story had convinced me that these naysayers were a bit loony. But to be fair I took a good look at some of the more extreme websites out there that argued the dangers of these appliances. Google “Microwave danger”, and after Wiki you’ll get several pages in a row that all post the exact same article, or slight variations on it. This article references many studies that supposedly prove that eating microwaved food is in fact hazardous to your health. Most of it sounds like absolute nonsense to me. But if you keep scrolling, scrolling, scrolling down you eventually hit some studies that don’t sound like complete hogwash. I’m in no position to evaluate the validity of these studies, and despite my bias I won’t dismiss them simply because I judge them to be in poor company. So I tried to find a site that refuted their claims and had no luck. In the end I came across this article on The Straight Dope . It basically says that there is inconclusive evidence that microwaved food might be hazardous, and that we’ll just have to wait for the truth to be unearthed. So I’m feeling a little less smug. Anyway, with this new-found unease over the safety of microwaved food I boldly went in search of a good recipe to try for this blog. I will interject that there are a few things that I always make in the microwave. Since discovering microwave rice I’ve never gone back, and unless I require caramelization I will use the microwave for squash every single time. I’ll tack relevant recipes at the end of this post. But for the blog I wasn’t satisfied with sides; I wanted to do a one-pot meal. I my search for microwave cuisine for this entry I became familiar with the name Barbara Kafka. Known as “The Microwave Gourmet” (also the name of one of her books), Kafka was already well respected in the food community when she got turned on to microwave cooking. The likes of Julia Child have praised her work and she received the Lifetime Achievement Award from the James Beard Foundation in 2007. She approached microwave cooking like a scientist, thoroughly testing hundreds of recipes in ovens of different wattages and with different portion sizes. The resulting books have been hugely popular. The books take the time to give instructions for different serving sizes in different ovens because apparently, microwave cooking is less intuitive than conventional methods. She asserts that her recipes should be followed precisely, and gives weights for ingredients to aid in precision measuring. Mixed in with all the rave reviews these books receive is the underlying frustration of the modern reader with recipes designed when ovens were at most 750 watts. Today’s models tend to be 1000-1200. I settled on Chicken Caprese, one of Kafka’s recipes, a few of which are posted on her website. Place chicken breast halves, thin sides toward the middle in a 12”-oval glass or ceramic pan at least 2”-deep. Leave enough room for half of the carrots at either end. 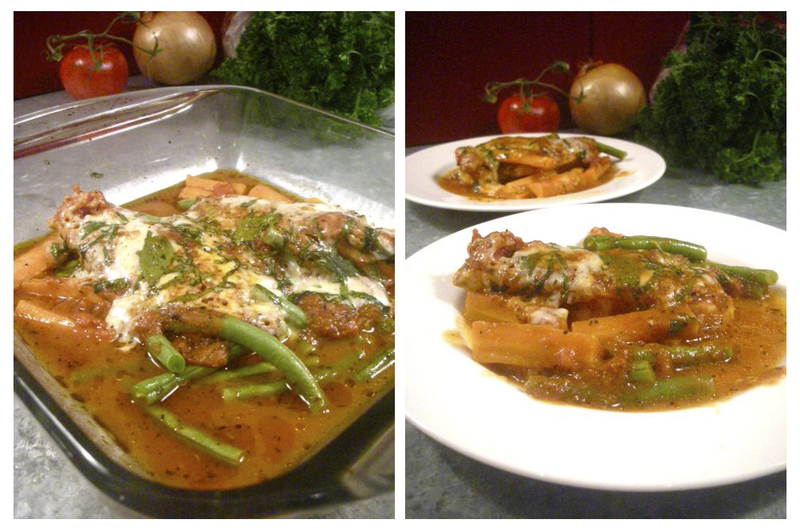 Put green beans in the center of the dish between the two breast halves. Pour half of the marinara sauce over each breast half. If using, place a slice of mozzarella on top of each breast half. Place three basil leaves on top of each breast half. Cover dish tightly with microwave-safe plastic wrap. It will not touch the food. Place in 1,200-watt microwave for 7 minutes. Open door of microwave and prick with the tip of a sharp knife the bubble that that the wrap will have formed. Remove from oven. If desired, sprinkle salt and pepper and olive oil on the beans. Serve. I armed L with a grocery list explaining how many grams of chicken we needed, and how many ounces of haricots verts. And promptly realized that I had misread the instructions and was going to be halving the recipe. Well, we had already eaten dinner, so in a way it was good. But was I going to have a micro-finicky recipe disaster on my hands? Okay, so I added the salt, pepper, and olive oil before cooking rather than after, and I used regular green beans, halved crosswise, in place of the haricots verts. The recipe is written for a 1200w oven and I think mine is 1000, though I’m not sure. I was making half as much food, so how should I cook it? Instead of 7 min. on high I began with 7 min. at 70%. I then checked the chicken with a thermometer and gave it another 90 seconds on high. The chicken was delicious and moist. It may have been just a hair overcooked, but that could also be because it sat in the baking dish for a few extra minutes as I photographed it. The sauce really makes the dish so make sure you’ve seasoned your marinara well. The beans were nice and crisp, and the carrots were just slightly softer than I would have liked, so next time I would move them more towards the centre of the dish. I know that sounds counter-intuitive, but one thing I’ve learned in all this research is that when you’re cooking a big pile of stuff, the outside edges actually cook faster than the middle. If you needed some starch, throwing in some cubed polenta could be nice. I have to admit, that as someone who routinely spends 2 hours cooking dinner it was blissful to make a delicious meal in under 15 minutes. And I didn’t fall down dead from microwave poisoning. I’ve done several kinds of squash in the microwave. Butternut, acorn, etc. work wonderfully using the same basic technique described in the recipe below. Pierce squash all over with a sharp knife. Place in a bowl to catch drips. Microwave on high about 6 minutes. Turn it over. Cook another 8-10 minutes, or until the squash feels slightly soft when pressed. Don’t over-cook it. Set it aside to cool. Heat the oil (you can do this in a frying pan or in a small bowl in the microwave). Add garlic and cook until golden. Stir in dry spices and salt and remove from heat. Carefully halve the squash (it’s hot!) and remove and discard the seeds. Using a fork, tease the strands out of the skins and into a large bowl. Toss the squash with the spiced butter and the cilantro. Plate it, then top with feta, if using. Combine all ingredients in a 2-3 quart deep microwave safe baking dish. Cover and cook on high for 5 min. or until boiling. Reduce to 50% power and cook 30 min. Fluff with fork. This article really made me think about how I use our “nuke” as we sometimes call it.. . it is 15 years old and I have always thought about buying a new one when you hear about all the stuff they can do, but I have a feeling I won’t use it! This article made me think about some things I could do to not spend so much time on supper. Thanks! Thanks Janelle! In our house “Nuker” is the noun and “Nuke” is the verb 🙂 Sorry the post was a little lacking in cohesion. I didn’t intend for it to be so long! Very interesting! Reminds me of a B&B we went to once: they did not own an oven; rather, everything was either ‘nuked’ or BBQ’d. Breakfast was interesting…a little chewy for my liking, but hey…they figured they had better things to do with their time. I prefer the old-fashioned method of the stove myself and have even gone so far as to remove the microwave from my home. So far, I don’t miss it!